The Mini Countryman starts at 20,200 euros in Germany. Engine:Turbocharged 1.6-liter 4-cylinder with 181 horsepower and 177 pound-feet of torque. Transmission:6-speed manual or 6-speed automatic. Speed:0 to 60 mph in 7.3 seconds (manual). Gas mileage per gallon:25 city/31 highway. Worst features:Bumpy ride, excessive tire noise. Target buyer:The Mini lover looking to expand. 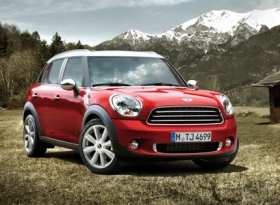 The 2011 Mini Countryman is a big Mini. Big, of course, is relative in this case, but this new four-door's size annoys purists, who point to the name of the brand itself. You can't have a supersized Mini. Yes, BMW AG says, you can. The Mini family, owned by BMW, now includes the various Cooper models, the larger Clubman and the all-new Countryman, which has been described as Mini's SUV. The base Countryman starts at 20,200 euros; 27,900 euros for the all-wheel-drive S model. Despite vigorous claims to the contrary, the U.S., BMW Group's biggest market, is still stuck on big cars. So it makes absolute sense for the company to expand what a Mini can be. The Countryman is a mega Mini, but only in a Lilliputian world. It's a mere 4095mm (13.48 feet) long. To put that in perspective, a Ford Mondeo is 4785mm and a BMW X3 4650mm. It is big next to a 2695mm Smart ForTwo, but sales of that car are not good. The original Mark I Mini was released in 1959 (about 3048mm). Its iconic status was cemented when three Cooper S's were filmed gamboling down outdoor church steps in the 1969 movie "The Italian Job." BMW introduced the "new" Mini Cooper in 2001 (about 3658mm), and it soon gained its own revered status (and a turn in an updated "Italian Job"). People love them. I've never got an ugly look for piloting a Mini. There's no mistaking the Countryman for anything but a Mini. It remains true to its overall dimensions, as if a Cooper had been ballooned with extra air. Yet the overall look is tougher, the exterior details more rugged. My test car was white with black hood stripes and a blacked-out roof and pillars. The front grille is upright, and body cladding around the wheel arches are also darkened. It even had black rims. Seriously cool. Mini knows its customers are through-and-through style conscious. The interior is vintage modern Mini, which is what I don't like about it. It's time to do away with the oversize clock-dial speedometer, which looks like it should be hanging in a school cafeteria. Fun 10 years ago, tired today. Same for the toggle-style switches. The Countryman seats four in bucket seats, and it's comfortable in the rear with good headroom. There's a metal rail running down the center of the cockpit, designed for clip-on accessories like a specialized sunglass case or drink holders. Overall cargo space with the back seats down is an ample 41.3 cubic feet. The turbocharged 1.6-liter four-cylinder engine has more elasticity than a bungee cord. My test had a six-speed manual, an ideal mate. In spirited driving you can rev the engine to the heavens in second and third gears, and cruise comfortably in sixth. It never seems to complain and has plenty of torque. An enthusiast's powerplant. Same goes for the stick shift itself. Easy to engage with a forgiving clutch, but interactive. It makes the Countryman fun even in traffic. I was much less impressed with the awd system, which is largely pointless. This is the first model to be offered with the option, but it overwhelmingly runs in front-wheel-drive mode anyhow, only transferring torque to the rear when it senses slippage. And it won't engage at high speeds. Attractive to those in the snow belt perhaps, but the added weight means that the front-wheel-drive-only S model is actually 3/10ths of a second quicker to 60 mph, taking seven seconds. The Countryman's added height and weight conspire to work against the go-kart handling that the brand is famous for. The Countryman is still maneuverable, just less so. My car had 18-inch run-flat tires which were extremely loud on the freeway and gave precious little cushioning on the bumps. Worse, the entire car lurches whenever it encounters a bump mid-corner, wrenching the steering wheel the opposite way. All problems that could potentially be fixed with a different tire choice. The mega Mini does mean trading in a few Mini-like characteristics. But for many customers, the extra space inside is worth the car's growing pains.